Massage a small amount on your lips, then wipe or lick off the sugar, leaving the organic oils to hydrate your already-beautiful pout. Crafted in Austin, Texas and packaged with care in dark amber apothecary-style bottles, our products are unequivocally toxin-free, organic, plant-based, effective, and luxurious. We are committed to creating products that not only smell and feel good, but are good with long-lasting benefits. To honor this commitment, we only source the highest quality ingredients - always as clean, all-natural, and organic as possible - because we believe it's just as important to nourish your body from the outside in. Natural exfoliant. 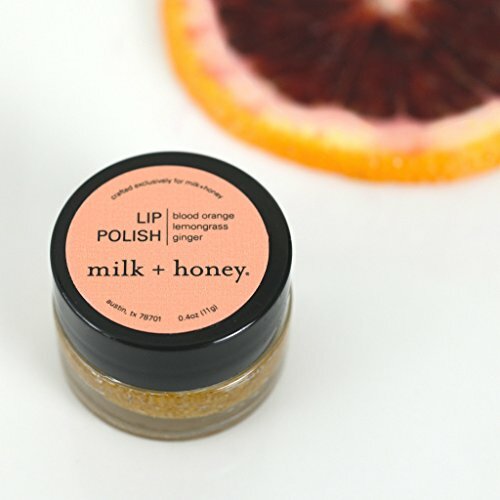 Eliminates dry, chapped lips by exfoliating gently with sugar, organic honey, and virgin coconut oil. Clean. Made with organic, plant-based, premium ingredients. Safe. Non-toxic and never tested on animals. Made in USA. Crafted in Austin, TX. If you have any questions about this product by milk + honey, contact us by completing and submitting the form below. If you are looking for a specif part number, please include it with your message.